A Fine Blue And White Porcelain Dish Folding Fans Arita ware. Enclosing flowering narcissus and chrysanthemum among crests in a swiftly flowing stream, the reverse encircled with scrolling of. Three spar marks to the glazed base with chatter marks, some kiln-grit adhering to the edge of the footring, some manufacturing imperfections to the glaze, covered with a plae blue tinged glaze in darker hues where thick, partly soiled. 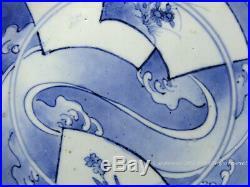 The blue and white Arita porcelain dish with. Design is thought to have been manufactured some time between 1680 and 1700 for home consumption. 19.7 cm (7.75 in) maximum cross diameter. Undamaged with no chips, cracks and restoration. Some manufacturing imperfections to the glaze. Old wear to the glaze in general use. Are antiques and works of art with some age, which are unconditionally guaranteed to be genuine as described. Offered by postal-administration members of the Universal Postal Union. We cannot be held liable for these charges under any circumstances, as they are beyond our control. All necessary permits in exporting goods from Japan are undertaken for purchasers. The item "A Fine Blue & White Arita (Ko-Imari) Porcelain Dish With Folding Fans. 1680-1700" is in sale since Friday, April 12, 2019. This item is in the category "Antiques\Asian Antiques\Japan\Plates". The seller is "at-asian-art" and is located in Saitama. This item can be shipped worldwide.